Vuzix has been a pioneer in the world of video eyewear, introducing the virtual reality video visor, the AV310 widescreen experience and now, video glasses that won’t make you look like you’re auditioning for Star Trek. In fact, the new Vuzix Wrap 920AV doesn’t simply combine a 60-inch viewing experience with the look of fashion sunglasses - you can actually see right through the screen into the outside world. Along with the viewing equivalent of a 60-inch monitor seen from 9 feet, the 920AV's offer removable noise-canceling earphones, six hours playing time from 2 AA batteries and compatibility with most video devices, including iPods. You can also get prescription lenses and the package weighs less than 3 ounces. But the really clever feature is down to something dubbed "Quantum optics technology", which permits you to still see through the lenses while watching a private video display. So you can be out in the world and no-one will ever know you’re really watching TV. 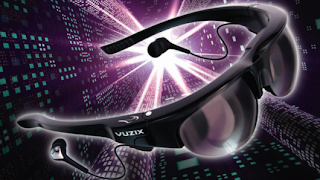 The Vuzix Wrap 920AV's are expected to hit shelves this year. No pricing as yet.